The steady stream of bad news over the last several months regarding the ongoing sexual abuse crisis in the Church, especially as it pertains to the failures of some bishops, has caused me to reflect on my own ministry as a bishop. Like many of you, I have been deeply shaken by these events and revelations, and I have taken this whole matter deeply into my prayer and reflection. One of the more fruitful points of my own meditation and reflection has been a remembrance of what was in my heart and mind on the day of my priestly ordination, almost 29 years ago. What was that young man thinking about and looking forward to on the day he was ordained a priest? I can tell you what was on his mind. I was looking forward to nothing more than being a shepherd, pastor and spiritual father in service of Jesus Christ and the holy people of his Church. I wanted to be available and of service to help teach and catechize God’s people. I looked forward to celebrating the sacraments for them, especially the Holy Sacrifice of the Mass and the Sacrament of Penance and Reconciliation. I wanted to be there with the people in the good times and the bad times, in the ups and downs of their lives, and in the joys and sorrows that they would experience. I simply wanted to accompany the people entrusted to my pastoral care in their own spiritual journey, leading them to a deeper life in Jesus Christ and ultimately to the Kingdom of Heaven. I can tell you what was NOT in my heart on the day of my ordination as a priest. The furthest thing from my mind was the idea that I would one day be called to the ministry of bishop. In all my years of priestly life and ministry, I never had any ambition or desire to be a bishop. What I really wanted to be was a pastor of souls. Nevertheless, the call of Christ came to me through his Church and asked me to accept this responsibility. Even as the bishop of a very small, rural diocese in the upper Midwest, I certainly never expected the call to become an archbishop here in the beautiful Northwest. That said, I have gladly embraced this call and have tried to do my best to be a bishop and shepherd after the heart of Jesus Christ. But one of the dangers of my position, especially as the archbishop of a very complex and diverse archdiocese, is the temptation to get swallowed up in the administrative details and burdens of my office. This can have the effect of distancing a bishop from both his priests and his people. This is particularly true in this very geographically large archdiocese here in western Oregon. So many of the good people entrusted to my pastoral care live at a great distance from the central offices here in Portland. The bottom line is that I do not want to be seen as a “CEO” type of archbishop. I want to recover, to the extent that I can, that desire of my heart that was present on the day of my priestly ordination. I want to be closer to my priests and to my people, getting to know them better, and allowing them to get to know me better as their shepherd. In the end, I simply want to be a shepherd, pastor and spiritual father. That has always been the desire of my heart. So I have come up with a new plan. It is a new way of doing my ministry as your archbishop. It is a way that I hope will bring me closer to you, and you to me. 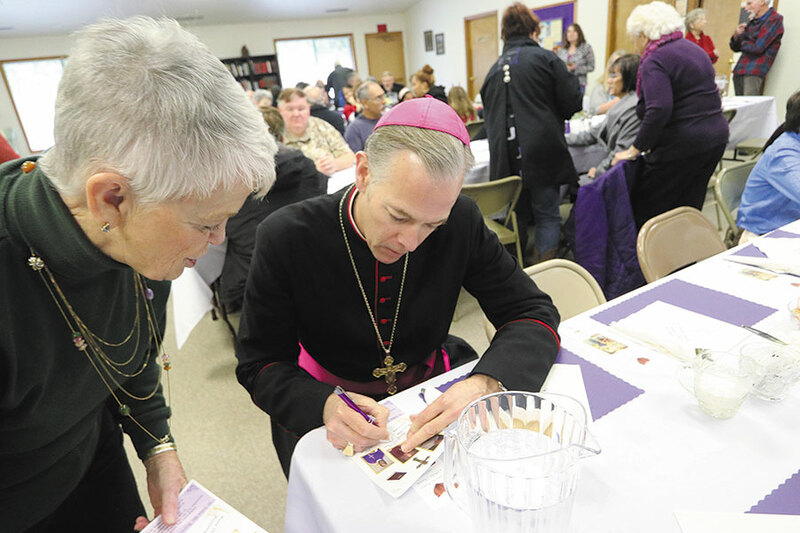 I plan to spend more time out of the Portland metropolitan area and in the other regions of the archdiocese. My goal is to spend about one week a month in another region of western Oregon. My first attempt at this new way of being present was spending almost a week in Southern Oregon in early February, visiting the people, the priests, and the staff of our wonderful parishes. As I write this column, I am preparing to leave for a visit to the north coast region to do the same. These visits will include several elements. I will literally reside in these regions for several days at a time. I will celebrate daily Mass in the various parishes of the region. I will spend an hour of Eucharistic adoration with my priests, followed by an informal dinner with them to simply have time for fraternity and to get to know each other better. I will also try to make myself available to meet one-on-one with the priests of the area, as the schedule will permit. I will visit the Catholic schools of the area and also meet with the priests and staff of our parishes whenever possible. I will take some weekend Masses, hopefully in four different parishes, as the schedule permits. A highlight of these visits will be an evening “townhall meeting” open to any of the people in these regions of the archdiocese. This will be an opportunity for the people to interact with me as their shepherd. It will take the form of a question-and-answer session where I will try to address the pastoral needs, questions and concerns of the people. This will serve the dual purpose of having the shepherd get to know the people better, and for the people to get to know the mind and the heart of their shepherd. My first experience of this in southern Oregon was without a doubt one of the best things I have done in my six years as your archbishop. I am confident that this will prove to be the case as I extend my visits to other areas. My plan right now is to visit Southern Oregon, the South Coast, the middle coast, the north coast, the Salem area, and the Eugene area. I will also plan some events in the metropolitan area of Portland. As I said, my goal is to do this about once a month, but I realize that will not always be possible. For example, during the confirmation season it will be practically impossible to do this. Nevertheless, I will do my best to be faithful to my intentions. Once I have visited all of the areas, I will go back to the beginning of the list and start all over again. This is not meant to be a one-time effort, but an ongoing one. I ask you to please pray for me as your shepherd, and I look forward to spending time with all of you. God bless you! Looking forward to your " town hall" meeting in the Southwest Portland area. Not happy with the direction our parish is going. We keep consistently losing parish graces rather than gaining them. Wanted to email you about it but you don't have an email address. This comment has been hidden due to low approval. Archbishop Sample: I think you have a great plan here and will keep you in my prayers. This comment has been hidden due to low approval. Dear Archbishop Sample, I am sure you are experiencing challenges with pastoral concerns. That is part of the burden of being an Archbishop. But, as Bishop first, and foremost, you are the " Good Shepherd". Your road trip visitations are probably what you need to do as the Holy Spirit leads you. This comment has been hidden due to low approval. Our little school and parish at St Francis in Banks, hope that you are able to come. This comment has been hidden due to low approval. We will delight in your visit and welcome the opportunity to be enriched by your presense and give back to you in some measure . This comment has been hidden due to low approval. An awesome idea! God Bless you in this endeavor. This comment has been hidden due to low approval. Archbishop Sample, I think your plan is absolutely awesome. I will pray for you that God will bless all your efforts. Wish you were still in Michigan! This comment has been hidden due to low approval. Dear Archbishop Sample, That sounds like a wonderful idea for your flock and for you! Sincerely, Alice Frantz (from your previous Diocese of Marquette) Sacred Heart Parish - Munising This comment has been hidden due to low approval. Thank you and God Bless you. This will go along way to bringing the church together and showing them God's love and concern for all. Thank Archbishop you are doing Gods work and it will be blessed. This comment has been hidden due to low approval. Yes, I am still concerned about the World-wide scandal of sexual abuse in the Catholic Church ( I am a convert since 1985). But now, we have the State of Oregon, as per the Archbishops of both Dioceses, having the Laity to submit to the Latin Rite in Masses on Sat. and Sundays! What is going on??? This comment has been hidden due to low approval.